Welcome to this weeks edition of Maritime Monday. 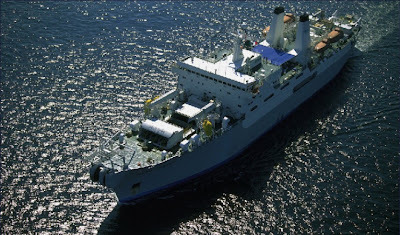 This is the cable-laying vessel GLOBAL SENTINEL. This vessel is operated by Tyco Telecommunications. Eagle Speak has "Port Security: The Hong Kong Model". I had the pleasure of meeting Eagle1 at the MilBlog Conference over the weekend. He has a roundup of the Conference here. You can find this week's edition of Sunday Ship History here "Sunday Ship History: The United States Exploring Expedition, 1838-1842" which notes the anniversary of the WWII Battle of the Coral Sea. Go to Steeljaw Scribe for a summary of the first day of the battle. Sailors, Mariners & Warriors League has the semi-submersible DOCKWISE SWAN's appearance in NY Harbor that resulted in 911 emergency calls reporting a sinking ship. Tims Times (at sea) has great posts on pilot boarding by catamaran, pilot disembarking by helicopter, and the locks in Antwerp. However, I am linking to this post since I too did something similar. It is a job hazard for Deckies. Be sure to scroll through his other posts. The Pilot Boat (at sea) has an explanation of Pilot Boarding. Shipping Times (UK) has the world's largest non-governmental hospital ship, the AFRICA MERCY, sailing for Liberia on its inaugural cruise. The crazy Kiwi at Sea (at sea) has a post about an encounter with a bird on the bridge while on anchor watch. This is also one of those posts that makes non-merchant mariners wonder if he went or was sent to sea. Now for Something Different has the amazing tale of "Yankee Ingenuity and Perseverance" featuring Captain Isaac Hull and the crew of the USS CONSTITUTION during the start of the War of 1812. All Americans should read it. Life at Sea has a poem on the firing of a boiler. Wikipedia has an entry on US Merchant Marine Awards and Decorations including an entry on the Merchant Marine Distinguished Service Medal which is the Merchant Marine's equivalent of the Medal of Honor, including the names of those who have received it. (Merchant Mariners are not eligible to receive the Medal of Honor.) The Merchant Marine equivalent of the Purple Heart is the Mariner's Medal. Popular Wireless has the ongoing problem of Foreign-Flag vessels illegally using GMRS frequencies (Explanation here) in the Chesapeake Bay. Scandinavian Shipping Gazette has a second life for single-hull tankers, as bunker barges in Nigeria. English Russia has amazing hotos of the remains of the KURSK submarine. Cruise Ship Law Blog has the news that the black box from the cruise ship SEA DIAMOND was brought to the US for analysis. MarEx Newsletter has "High Ship Prices Expected for Next Two Years"
The Raleigh Chronicle has four new container cranes for the Port of Wilmington, North Carolina. Fundamentalist Cycling has a crossing situation with a cargo ship during his morning drive to work. Maritime Digital Archive has US calls at the World Trade Organization for an end to fishing subsidies. Perth Now has "New fears hit plagued port" concerning exports of lead and nickel at Esperance Port. The Fiji Times claims that over 90% of the Japanese Population is unaware of the extent of their country's whaling activities. 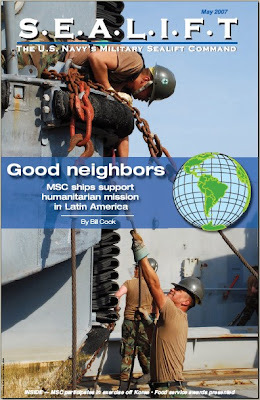 Military Sealift Command (MSC) has published their May edition of SEALIFT Magazine which includes a story on the upcoming retirement of the combat stores ships USNS SPICA and USNS SATURN. You can find MSC's 2006 Year in Review, which is full of great photos, here. Sri Lanka News has the complete looting of the cargo and everything removable from the Jordanian Cargo Ship FARAH 111 by Tamil Tigers. Helsingin Sanomat covers submarines in the Baltic Sea while taking a trip on the Finnish Attack Craft FAC PORVO. Your suggesions are always welcomed. Is Black Culture behind the DC AIDS Epidemic? Do You Know If You Have A Margin Account?